On this National Camera Day 2018, it's a good time to think about keeping your cameras safe. Many photographers will spend hours talking about their favorite camera and how it improves their work. (I often wonder how much could be accomplished if they spent the same time talking about technique, but that's another blog post.) Yet, in spite of having $1,000 (or more!) hanging from their neck, they do little to think about protecting it. In my estimation, the camera bag and strap are as important – if not more important – than the camera itself. After all, that good is the newest digital-do-it-all-camera if you can't get it out of the bag quick enough to take the shot, or, worse, if a strap breaks sending your camera crashing into the ballast? I have multiple bags of various sizes and styles. There are backpacks, slings, and messenger bags. They are black, orange, purple, and gray. They hold two cameras and a laptop, one camera and a tablet, or just a camera and spare lens. 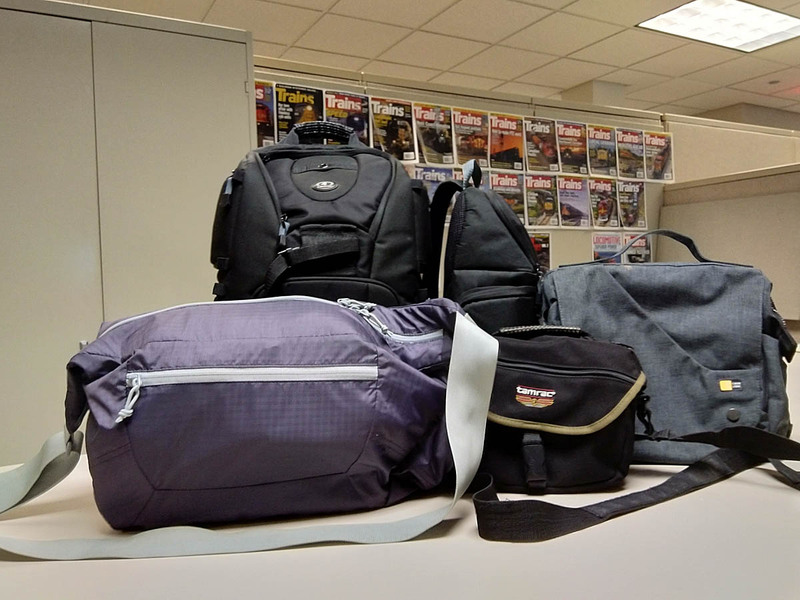 There's a shoulder-style bag that holds full-frame DSLRs, a variety of lenses and speedlights, and about any accessory I could need in the field. It's my go-to bag for car-based trips. There's a sling-style bag with a crop-sensor DSLR, versatile 18-300mm zoom lens, and compact speedlight for a quick grab-and-go. It's often what I take on weekends when I don't plan to do any photography, but want to carry a camera "just in case." Then there's a messenger bag with the mirrorless setup for trips that require flying. It fits under an airplane seat with room to spare. I keep the backpack for the rare times when I want to fly with the DSLRs as it fits under the seat better than the shoulder bag. I'm always looking out for new bags, too. If I find a good deal from an online vendor, I'll take a chance. You can often find great deals high-quality camera bags if you're flexible on color. That's how I've ended up with bags that are purple and orange in my collection. The holy grail for me: a messenger bag that fits an iPad and mirrorless camera setup snugly. Many of the messenger bags are designed for small DSLRs, which still lets the yet smaller mirrorless cameras move around some. Many of the mirrorless-specific bags aren't large enough to hold an iPad. So the search continues. What's your favorite bag, in style, brand, or model? Do you keep a few on hand to fit different needs, or make do with just one?